Due to supply and demand, notching a Florida turkey tag with a coveted Osceola is easier said than done. Just thinking about hunting Osceola turkeys in central and south Florida stimulates my senses. These birds roam some of the most incredible habitat in the wild turkey’s range. In Osceola country, you’ll encounter palmettos, palm trees, tall cypress stands, aromatic orange groves and sprawling cattle ranches. My very first hunt for Osceola gobblers unfolded on a large, 60,000-plus-acre Florida wildlife management area. I spoke with the area wildlife biologist, who pointed me in the right direction. Some scouting revealed no gobbling and only a few old turkey tracks. Given how prime the habitat looked, I decided to give it a go anyway. There had to be a tom in there somewhere. Despite my extra-early arrival on opening morning, I found a plethora of other hunters were already in the WMA parking area, and some had already left their vehicles and headed afield. It felt like opening day of Wisconsin’s gun deer season. I pulled an orange vest on that I wore until I arrived at my preselected hunting area. Just as I was reaching my spot, I walked past a couple of decoys. Darn it! Someone had beaten me there. I continued walking and basically just decided to wing it. After a half day of hunting, I hadn’t seen a single bird or heard any gobbling. However, I decided to push deeper to a clearing I was unable to scout before the season. There, I found fresh turkey tracks. I returned the following morning to watch that clearing. Just before daybreak, I spotted two hunters approaching the clearing and gently said, “Excuse me … I’m hunting here.” They graciously retreated, and I settled in and began watching my hen decoy. Half an hour later as the sun peaked above the horizon, a jake popped into the clearing 100 yards away. When he saw my decoy, he became roadrunner. That’s how skittish Osceolas can be on Florida’s non-quota WMAs. Still, folks kill Osceola toms on them every single year. It is doable. While leaving the property, I learned that only six jakes had been taken during the first three days of the season on that colossal property. Given the acreage and number of hunters I witnessed (and the dozens more I didn’t), that’s a very low success rate. You won’t find a prettier locale in which to hunt wild turkeys than south Florida, a landscape teeming with beautiful scenery and magnificent Osceola longbeards. On the opposite end of the spectrum, I’ve also recently spent two springs guiding clients for Tag It Worldwide in central Florida. While doing so, my clients all claimed birds. And I took two toms of my own — one with a Hoyt bow and one with my Benelli Nova 12-gauge. Part of that 100-percent success rate is the fact that outfitter Jeff Budz seals up prime leases on which his clients get to hunt. The other part is understanding how the Osceola is different from the other turkey subspecies and hunting accordingly. To the untrained eye, an Osceola gobbler looks like the Eastern subspecies. However, it has distinct differences, the first being its home range. 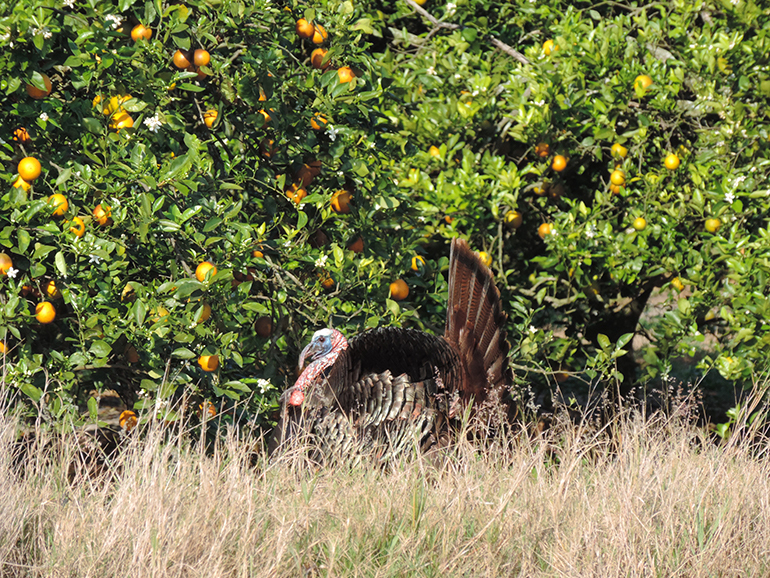 Central and south Florida are the only places in the world where Osceola turkeys exist. And since it’s the only place to hunt them, knocking on doors will likely be futile since these birds are worth a premium. Landowners lease their ground to outfitters for $1,000 per bird or more. Why? Because they can. It’s a supply-and-demand thing. For that reason, Osceolas can be the most difficult turkeys to harvest. Either you pay to play — outfitters charge $1,800-$3,000 — or you go the low-odds public-land route. Neither option is easy or awesome, but if you want to complete your Grand Slam, you do what you must. Back to differences. Osceola turkeys weigh far less than the other subspecies. Most gobblers weigh in the 14- to 17-pound range. Some even weigh as little as 10 pounds. Their gobbles and spit-and-drum sequences don’t seem to throw you out of your chair like a boomer Eastern, but they gobble hard and put on exciting displays, nonetheless. Florida’s dense swamps and thick morning humidity work to squelch gobbling. I’ve had times when I was within 200 yards of roosted birds and could barely hear them gobbling. Fields and pastures offer a farther audible range, but gobbling birds are still usually closer than they sound. As a rule, if you hear a Florida bird gobble in the dense brush, you’d better sit down and raise your shotgun, because he’s probably very close. 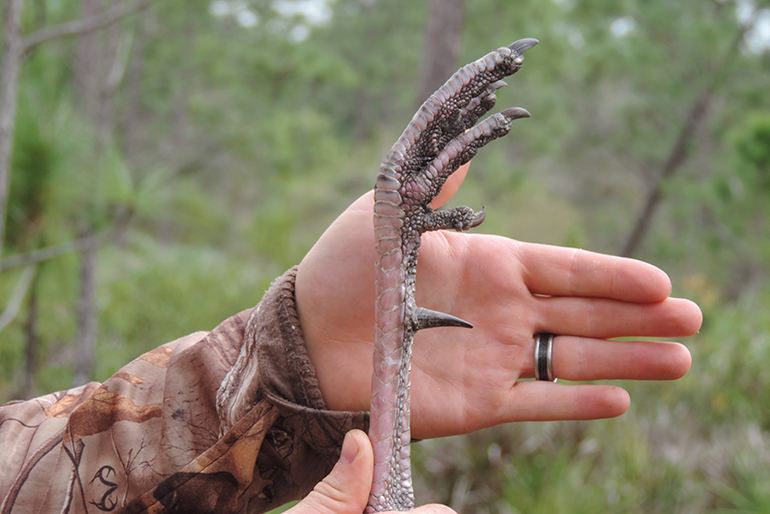 On average, Osceola gobblers tend to have longer, sharper spurs than the other three subspecies. It’s not uncommon for hooks to measure 1 ¼ to 1 ½ inches or longer. Beards are similar in length to those of Eastern gobblers. The Osceola’s wings are its most distinguishable traits. While an Eastern gobbler has lightly colored wings with black bars, Osceolas have black wing feathers with subtle white streaks. The birds are very dark in color. Since Osceola habitat is limited to Florida’s southern half, these birds are highly sought after. Public properties like the WMA I hunted are overrun with hunters. Florida does have WMAs with quota permits, which reduces hunting pressure on these properties, but you must apply and draw a permit. Special-opportunity hunts (visit myfwc.com for more info) are an even better option that can be more like a private-land hunt, but drawing these hunts is difficult. Last time I looked into it, you could submit unlimited entries for $5 a pop. The more entries, the better your odds. I suppose you’d stand a decent chance if you put in $200 worth of entries, but it isn’t guaranteed. During my first Osceola hunt, I determined that I probably wasn’t going to score on the WMA I was hunting, but I was running out of time. I was too late to apply for the quota or special-opportunity hunts, so an outfitter was my next best option. 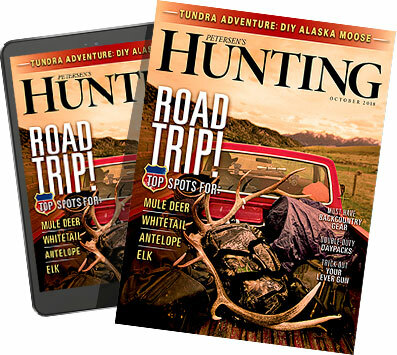 I called a fellow outdoor writer who’s hunted Florida several times to ask if he could connect me with someone. He lined me up with Jeff Budz of Tag It Worldwide. His turkey leases are loaded with very responsive gobblers. The difference between public land and private land in Florida is astounding. Outfitters offer a limited number of hunts on prime properties. So, the birds are far less flighty. In fact, they are probably more responsive to calls and decoys than most Easterns, at least in my experience. If you want to make one trip to Florida and get your bird, I’d put my money on Budz’s outfit if I were you (www.tagitworldwide.com). People often mistakenly assume that Osceola gobblers are the most elusive of the wild turkey subspecies. I disagree, because it’s all relative to hunting pressure. Unpressured private-land Osceola gobblers, as I just mentioned, are typically the easiest birds to call and decoy. Tactics for these swamp-dwelling toms differ little from Easterns, but I do recommend calling more loudly than usual, especially if there’s additional commotion such as highway traffic. Remember, Florida’s dense canopy and humidity reduce audible range. A quality box call or loud mouth calls are my favorite. I always use my Dave Smith half-strut jake decoy when hunting on private land or while guiding. Most toms come in fast and pummel the decoy. Although I’ve experienced similar results with Easterns back home in Wisconsin, I find they aren’t consistently as quick to pick fights as Osceolas. These aren’t hard facts, but simply observations from two seasons of guiding for Osceolas and comparing those notes with my 16 years of hunting Easterns. 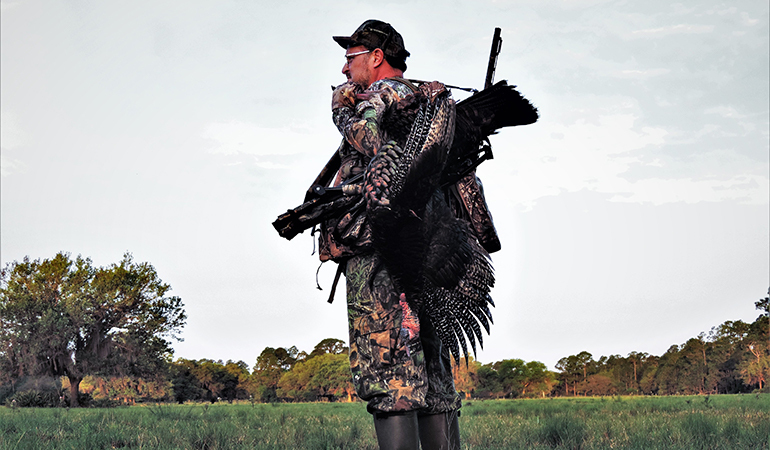 Going outfitted for an Osceola turkey hunt might be expensive, but if you love to turkey hunt or are looking to complete a Grand Slam, the entire Florida turkey-hunting experience is well worth the price of admission. Plus, it’s the only place in the world to hunt the Osceola. And if you’re from a cold climate like I am, what could be a better way to kick of the spring than hunting balmy Florida in early March?